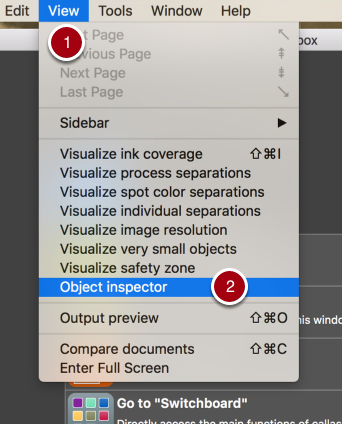 In the visualizer section of pdfaPilot Desktop, the Object Inspector allows identifying page content, both viewing which objects form a PDF page, and what their attributes are. Two additional concepts: "Wireframe viewing" and "Object type filtering" have been implemented here. 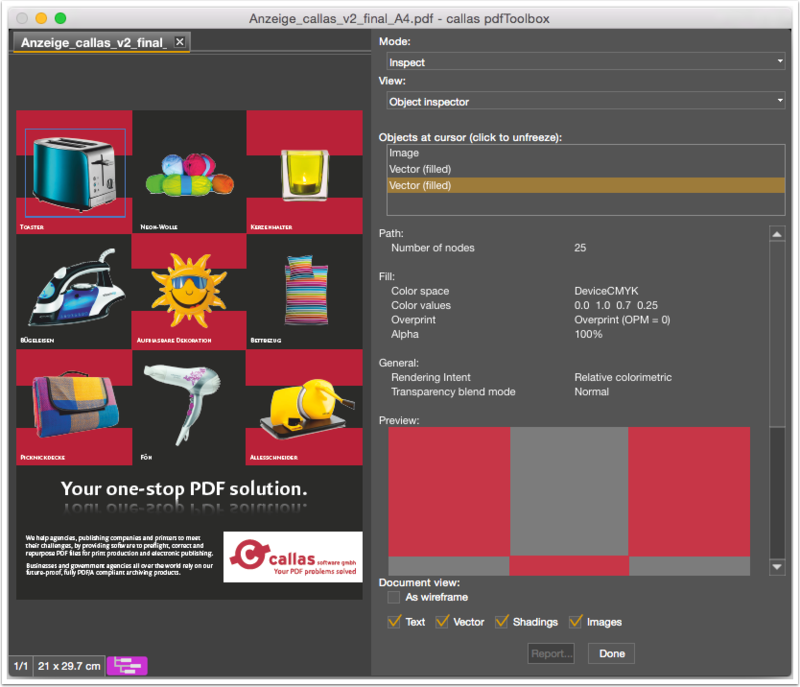 The screenshots are showing the sister product pdfToolbox. The functionality in this part of pdfaPilot is identical to pdfToolbox. 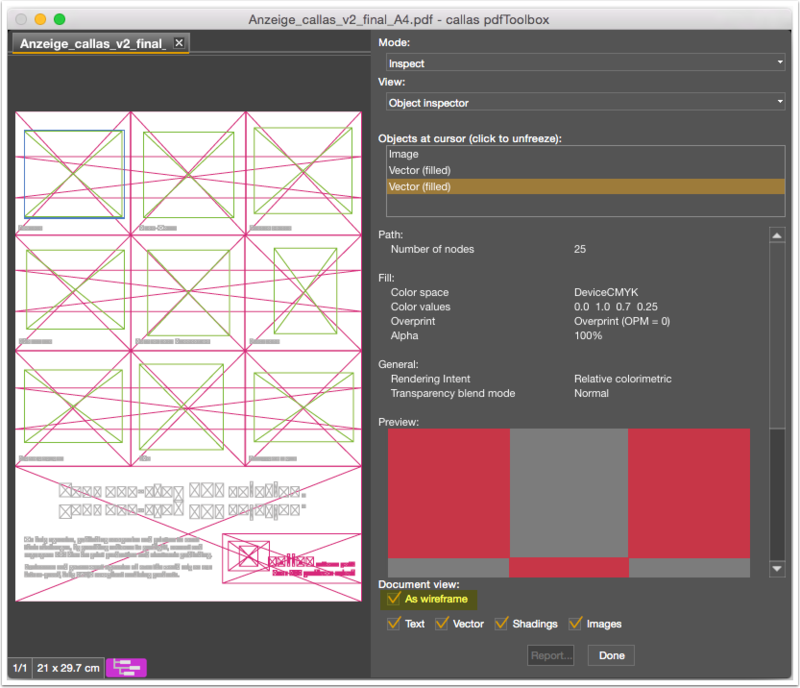 By default, the object inspector shows all PDF objects on the page. This can be changed by disabling or enabling the checkboxes at the bottom of the Object inspector area. Deselecting "Text" for example, will cause all text objects on the page to be hidden. This allows examining whether objects are actually text for example, or allows viewing what is behind other objects (and normally hidden from view). Every single object can be selected by clicking on it inside the view on the left hand side. A click will fix the selection on the right hand side. Another click will release it. Selected objects are also visible in the preview on the right hand side. Under "Objects at cursor", you will see a stack of all the objects in the same order as they appear in the PDF. The topmost object is the topmost in the PDF. You can click at objects below the topmost object to see it's properties. At the bottom of the Object inspector area, check the "As Wireframe" checkbox, to show the displayed PDF page as wireframe. In this mode, all objects are shown with differently color rectangle outlines. This allows seeing the structure of the page (which objects are on the page, how they are layered etc...).